Take your landscape to the next level with an outdoor kitchen. Every year as winter turns to spring, many homeowners start to consider how they can get the most from outdoor living. Warm weather makes you want to be outside, and there’s no better way to enjoy Maryland’s beautiful seasons than by gathering those you love around an outdoor fireplace. Here are 4 reasons to get an outdoor fireplace. With an outdoor fireplace, your outdoor living season will definitely expand. You’ll be able to stay warm and cozy outdoors, even as the weather gets colder, for years to come. You’ll be able to stay out late into the Maryland fall and early winter. This outdoor living staple gives you year round options for utilizing your property and home. An outdoor fireplace can be an entertaining fixture. It provides a soft and welcoming atmosphere that’s perfect for guests. It is ideal for the low-key party planner that favors intimate evenings around the fire over booming music, video games, or other high tech entertainments. It is an ideal way to entertain and make everyone happy. An outdoor fireplace raises a home’s market value significantly. It is a unique feature that can make any home stand out in a market of largely similar properties. According to real estate experts, for every dollar you put into landscaping projects, you get a $2 return. 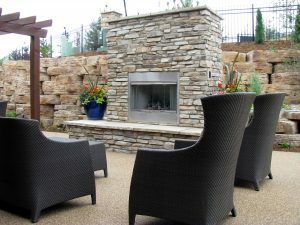 It’s easy to make your backyard an escape from the stresses of everyday life when you install an outdoor fireplace. Blazing bonfires are crowd pleasing and fun, but are not always practical in residential areas. If you want the warm glow and soothing ambiance of a fire without the massive amount of work that goes into creating and maintaining a bonfire, or you can’t do that in your surroundings at all, an outdoor fireplace is definitely for you. They provide beauty in a safe and conscientious way that allows you to truly relax. Whether you want to upgrade your swimming pool cleaning system or get a beautifully-installed pool or outdoor fireplace in your yard, Paradise Pools can complete the job. We have the expertise to walk you through every step of the process and ensure that you end up with a pool or outdoor fireplace you can’t wait to take a dip in. Ready to get started designing the perfect pool or outdoor fireplace for your home? Trust us with the job and have it in no time! For more information, contact us online or give us a call at (301) 725-0005. To get more fun pool design ideas, follow us on Facebook, Twitter, Pinterest, Google+, and Houzz. This entry was posted on Friday, March 31st, 2017 at 4:10 pm. Both comments and pings are currently closed.